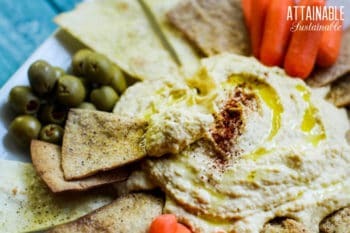 This easy hummus recipe is fabulous served with a bit of feta cheese and kalamata olives or on a vegetable platter. It’s a great high-protein appetizer or light lunch. It kind of blows my mind that so many people buy hummus out of the refrigerator case. But then it occurred to me that maybe it’s because that’s the only hummus they’ve ever had. Maybe they don’t know how easy it is to make! Recently, my son came home with a friend of his. 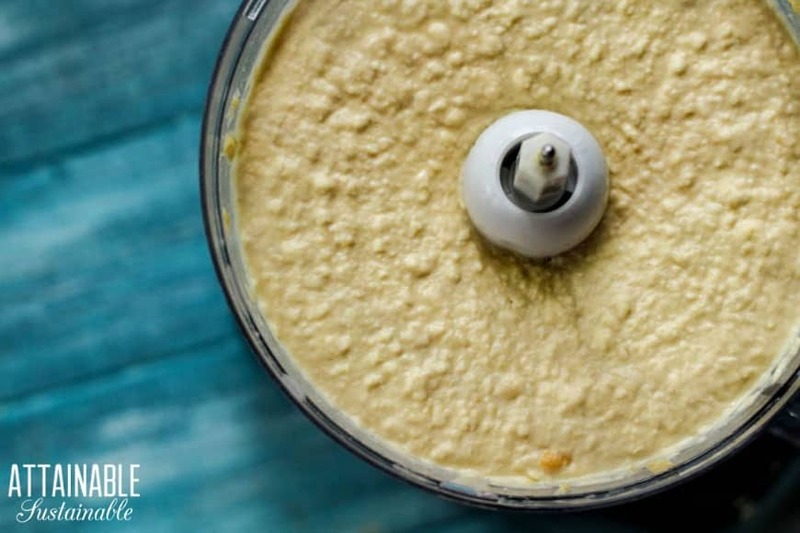 They were hungry, so he decided to make a batch of this easy hummus. His friend was in awe. “You can make your own hummus?” She had no idea this was a possibility. All she’d ever known was the store-bought, plastic tubs of hummus. She didn’t realize hummus was made from garbanzo beans. The first time I had hummus it was homemade by a woman who was hosting a toddler playgroup at her home and she graciously shared her easy hummus recipe. Eons ago. I’ve been using that easy hummus recipe ever since. 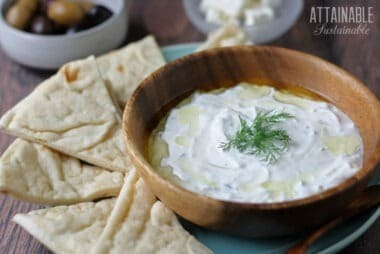 I love this hummus recipe served with a bit of feta cheese, kalamata olives, and sliced tomatoes. If you love high-protein hummus as much as we do, be sure to try this spicy hummus recipe and this roasted red pepper hummus. This easy hummus recipe is fabulous served with a bit of feta cheese and kalamata olives. It's a great appetizer or light lunch. Drain beans, reserving some liquid. 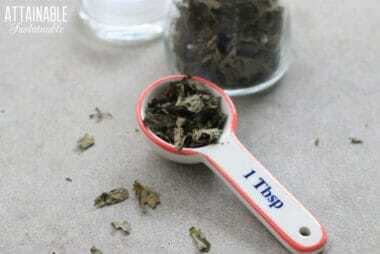 Measure all ingredients except salt into the bowl of a food processor. Process until smooth, adding a little more lemon juice, some of the reserved liquid, or water if necessary. (My husband thinks it’s too lemony if I use lemon juice; I like it that way – this totally depends on your preference.) Add salt to taste. Store in fridge. Soak one pound of beans overnight, making sure they’re covered by about 4″ of water. Drain and rinse beans. Put beans in a stock pot, again covering them with about 4″ of water. Gently boil for about an hour or until beans are soft. Drain. Use four cups of cooked beans in recipe and freeze the rest for next time. 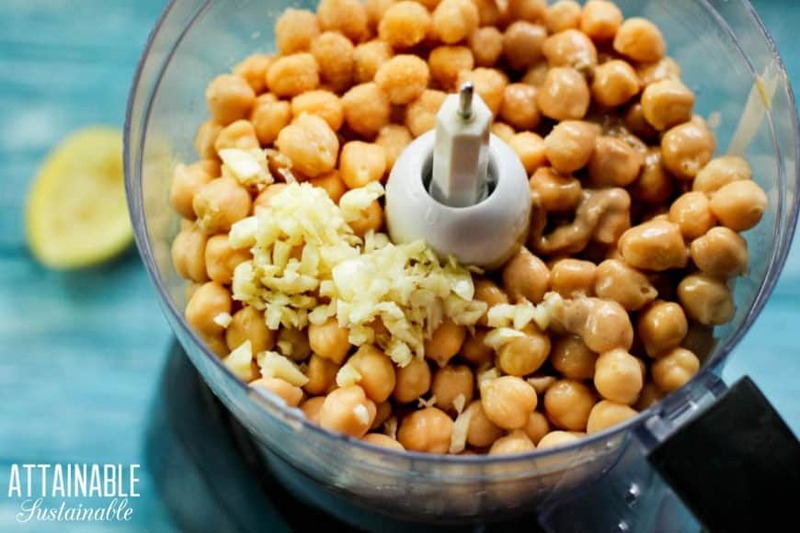 If you don't have a food processor, you can still make this easy hummus recipe, though it will take a bit more effort to smash the garbanzo beans. You can use a pastry blender, a potato masher, or the back of a wooden spoon. I love to add some roasted red peppers. I use the juice from the peppers to thin it out. Oh, I may have to try that. We’re fans of adding a little chipotle pepper to spice it up, too. I recently bought a pressure cooker and make all kinds of hummous with garbanzo, fava and canelli beans. Delicious! I usually use a pressure cooker, but in this case I was teaching my college-bound son how to make it with basic kitchen utensils. Plus, I know not everyone has a pressure cooker! Yes! Try white beans. Although, don’t completely give up on the idea of garbanzos. I can’t stomach them myself, but I DO like them in hummus! try cilantro in it also! I love your blog!! I wondered why mine turned out lemony. Can’t wait to try out the recipe. In summer I’m going to add eggplant to it. Oh, eggplant would be good, too! I was confused about the garbanzo beans, but google has confirmed that they are also called chick peas, that’s what I thought was in hummus! So the translation for those of English/French decent – garbanzo = chick peas! I like learning all these new words from you 🙂 Anyway, thanks for the recipe, it seems to simple, I just need to get some tahini now…..
That’s funny! I think we don’t realize that there are so many regional terms for things until we start meeting people from across the globe. I hardly ever have tahini, so I put sesame oil in mine instead. I think I prefer it that way. I also like to blitz some preserved lemon rind, olive oil and smoked paprika to drizzle over then sprinkle with toasted pumpkin seeds. Yummo! I know someone who substitutes ricotta cheese for the tahini because she doesn’t like the sesame taste. It’s really a pretty forgiving recipe! I’m not a big thing fan, so never have it on hand. I just omit it and don’t miss it a bit! I add an extra drizzle of olive oil for texture, if needed (though, who am I kidding? I never measure anyway, haha). I’ve heard of people replacing the tahini with ricotta cheese, too. I do love hummus, and wow, so so easy. Thanks for the recipe. I have never put cumin in hummus so will have to try. The best hummus I ever made was in Sweden. I bought a bag of garbanzo beans at an organic farm. Cooked them up. They tasted so incredibly sweet. Wish all hummus tasted that way. Alexandra, what recipe did you use that time? been several months since I’ve made hummus — far too long! thanks for the reminder. it’ll be fun to make some over the holidays. I made my own hummus once and the tahini to go in it but I think my sesame seeds were rancid. I prefer light on the lemon and a little more garlic. I’ll buy fresh tahini and try again. Try an extra pinch of salt and a dash of extra sesame oil to jazz it up. Also, since you like it lemony, add just a pinch of sugar – it makes the acid sing better. And I second the pressure cooker. If you soak your beans overnight first you only have to pressure cook them 4 minutes! That is sustainable :). I love hummus and am going to try your recipe, which is super- easy and sounds delicious. Thanks! For those wondering about Tahini – you can make that yourself too! It’s really just sesame sees pureed with a little olive oil. Also if you’re adding peppers try drying them out on a paper towel for a day or so before adding them, or roasting them in a little olive oil. This will prevent you from adding too much water to your houmous. And if you don’t have a food processor can it be done with a masher or stick blender? It’s probably too thick for a stick blender, but my son made this while he was away at college by just mashing the beans. I just made a batch and used my immersion blender, which I think is the same as a stick blender, right? It worked just fine but I only made half a batch (2 cups) . Does anyone have any suggestions for wannabe vegetarians with colitis? I have ‘micro’ colitis, and raw vegetables and legumes are simply intolerable for me, much as I used to eat them before the development of this condition. Any advice would be GREATLY appreciated! Hummus is made with cooked beans, so you should be good with this recipe. But if not, replace the beans with roasted eggplant; you’ll have made babaganoush instead of hummus, but it’s equally amazing! Definitely making some of this soon. I got out of the habit several years ago, and haven’t gotten back in. 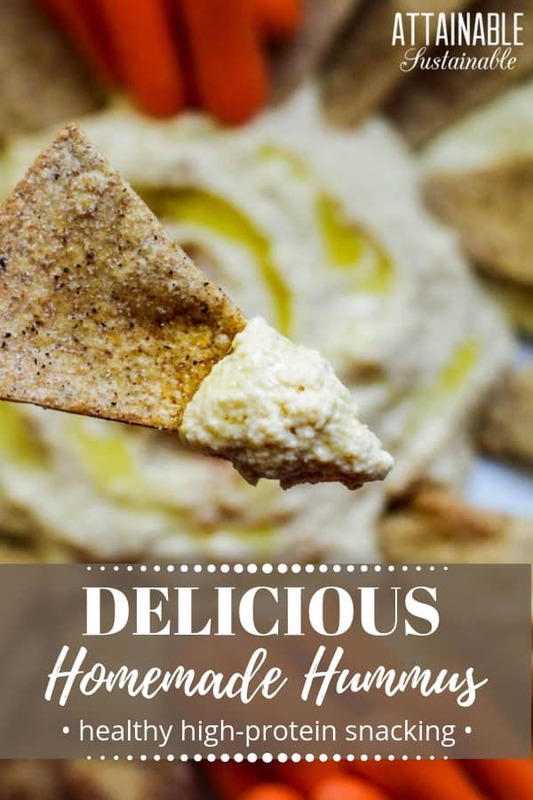 But homemade hummus is such a great snack item to have handy! Looks great, wondering how long will this last when refrigerated? Can it be frozen? Thanks much!! The texture might change a bit with freezing, but it can be done. It lasts about 4-5 days in the fridge. Thank you so much for this great recipe – so easy and quick to make. I have played around with adding artichoke hearts and pesto to this and have found it to be not too strong. Besides roasted red pepper – which I have also added – I am wondering what other flavor combinations have been made with this? If you like things spicy, try adding a chipotle pepper! We really like that. I have made hummus with sun dried tomatoes and roastedgarlic to give it an itlaian flare and even made a curried hummus. In truth the beauty of hummus is its versatility. You can substitute the beans for others and pretty much enjoy playing with your recipes. I start with a base recipe very similar to this one and then just change, add or omit ingredients based on what flavor profiles I am going for. Yes! It’s excellent with chipotle peppers, too! We put oregano in ours, too. This makes a great snack. It was easy to make as well.